There are times where we need to type out some skeleton codes, and if we smart enough, we copy it from existing one and change some variable, what if we can use shortcut to insert that skeleton codes, and using tab to change all the variable we needed to change? 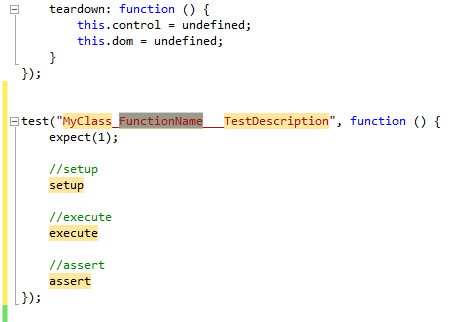 This is the snippet for QUnit test. The key here is the Literal, we can define ‘token’ that we want Visual Studio to tab into, so that we can quick change those ‘token’. The ID in the Literal should be matched with the one we define in the <Code>, by wrapping the text with $ sign, e.g. $ClassName$. Visual Studio will pick this up and allow us to use tab to jump into the token. Then we can use tab to jump through those highlighted text and do modification, no mouse or arrow key required, we can press Esc to cancel off this anytime.